In February, I took part in the first Advanced Topics webinar for the BitCurator Consortium, centered on using the KryoFlux in an archival workflow. My co-participants, Farrell at Duke University and Dorothy Waugh at Emory University both contributed wonderful insights into the how and why of using the floppy disk controller for investigation, capture and processing. Many thanks to Cal Lee and Kam Woods for their contributions, and Sam Meister for his help in getting this all together. If you are interested in using the KryoFlux (or do so already) I recommend checking the webinar out, if only to see how other folks are using the board and the software. If you are trying to set up KryoFlux in a Linux installation (e.g. 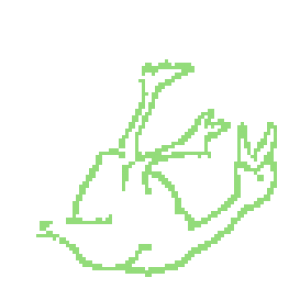 BitCurator), take a close look at the instructions found in README.linux text file located in the top directory of the package downloaded from KryoFlux site. It contains instructions on dependencies needed and the process for allowing access to floppy devices through KryoFlux for a non-root user (such as bcadmin). This setup that will avoid many permissions problems down the line as you will not be forced to use the device as root, and I have found it critical to correctly setting up the software in Linux. A re-post from the Preserving Games blog, February 12, 2010. The book doesn’t refrain from the technical. I could have used even more elaboration than what is presented in the book, but after a certain point the book would turn into an academic or technical tome (not that there’s anything wrong with that), so I appreciate the fine line walked here. The authors succeed at illuminating technical constraints enough for the general reader to understand the quality of the engineering solutions being described. Moreover, the authors leave room to discuss the cultural significance of the platform, and to reflect on how the mechanics and aesthetics of these Atari titles have informed genres and gameplay presently. A re-post from the Preserving Games blog, January 24, 2010. This week I’ve been working with Omeka a good deal, experimenting with an approach to modeling and documenting a computer system through it. I see two “issues” presently. The first is what metadata and what documentation needs to be provided for MITH’s purposes, the second is how to present and organize all this information. It seems desirable to try and model hardware and computing systems through component pieces and parts. This allows one to describe the specific locations of a certain types of firmware and software, and it allows parcelling out documentation to a flexible level of granularity or generality depending upon the item being described (e.g. a motherboard, a ROM chip, a connector, a floppy, or a computer system). For example Apple IIe systems either have Apple DOS or ProDOS on them. 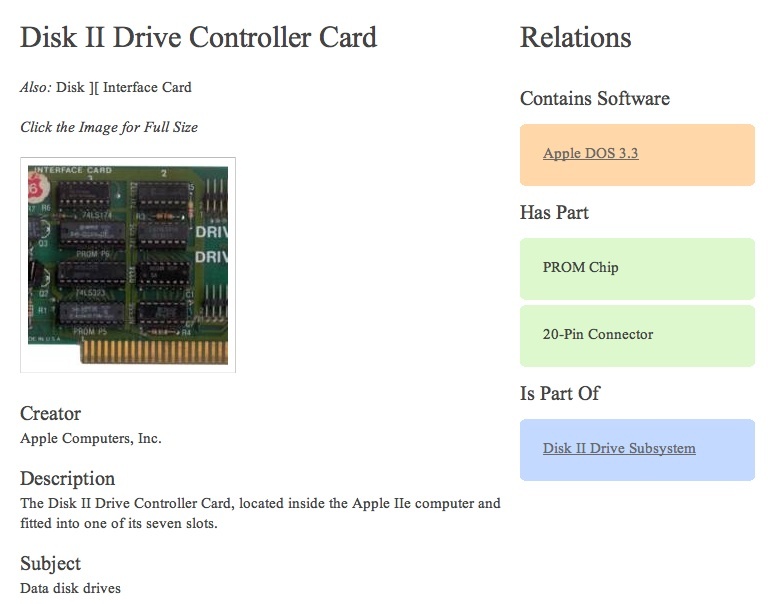 Specifically, that software is located on the PROM chip of the Disk II controller card, and it operates with Applesoft II BASIC, located on a ROM chip on the motherboard. What appears as a fluid interface on the screen is really two pieces of software in two different places, and each has a distinct history and properties. Articulating this distinction seems especially appropriate for organizations that will be using their systems for research and media access, and would like to assess the details of a machine or of media at a glance. There isn’t an organization I’m aware of that is doing this for its audience or users at this point. It seems typical to document extensively at the level of the computer system. That is intuitive, especially in the timeframe that saw so many vertically-integrated personal computers (Commodores, Apples, IBMs) but the march of PC clones complicates that approach. In another light one can see this as the popular ideal of the computer. For example, the iMac: it looks like it doesn’t have any parts, like it sprung from the forehead of Jobs, fully formed and completely capable. And it is pleasing to the eye. Anyways, it’s been really edifying to do this research. Omeka’s API has been pretty capable for this sort of task too.